April has been designated as National Pest Management month by the National Pest Management Association (NPMA). The Professional Pest Management Alliance (PPMA), is the “consumer education arm of the National Pest Management Association” which provides information to consumers about “the value of our industry and our ability to protect health, safety and property” according to the NPMA’s website. Recognizing that bed bugs are still a major problem throughout the United States, the PPMA has designed the last week of the National Pest Management month to be “Bed Bug Awareness Week”. In such, they would like to remind consumers to be vigilant in their quest to avoid bed bug exposure this summer travel season. The PPMA recognizes that having knowledge about bed bugs, their habits, and their harborage will help consumers avoid bringing the blood thirsty pests home with them this summer. Stern Environmental Group is a leading authority on bed bugs. We have extensive experience with bed bug eradication and offer a multitude of bed bug products to help consumers remain bed bug free. 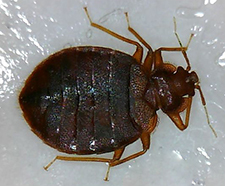 • Check for bed bugs in any hotel or motel upon your arrival. Carefully examine the entire bed, headboard, furniture and room. Remember, even 5 star hotels can have bed bugs at any moment in time! • Check for bed bugs when visiting a relative’s home. Having bed bugs is not a sign of uncleanliness. Anyone can pick up bed bugs from any location. • Use the luggage rack in a hotel/motel. Never place your luggage on the bed or carpeted floor areas. The slick surface of the bathroom is also a good area to store luggage. Mutant Bed Bugs Found In Scotland! New York City has been touted by some pest control experts in other parts of the world as being the bed bug capital of the United States. Nearly wiped off of our radar screen in the 1950’s, bed bugs have certainly made a comeback on America’s landscape. They have now reportedly been found in all 50 states. Larger U.S. cities, with more dense populations, understandably have had more trouble with the bloodsuckers, but bed bugs are indiscriminate blood thirsty characters. They do not care where you live or what your economic status is. They are after one thing…blood…preferably from a human host. Scientists in the United States have previously reported that bed bug infestations have become more difficult to kill from coast to coast. Modern day bed bugs have been able to transform themselves so that they can withstand current pesticide treatments that are available to New York, New Jersey, and other pest control professionals across the United States. Bed bugs that are found today have mutated and now have a stronger exoskeleton which is able to withstand pesticides that are used by pest control experts. In additions, this new breed of bed bug has also changed its genetic makeup which has further enhanced its ability to survive. JunkScience.com reported on April 16, 2012, that “mutant bed bugs” have now been discovered in Scotland. Pest control experts are finding that Scottish bed bugs are now twice as difficult to kill in comparison to years past. According to reports, policy makers and scientists in Scotland are looking at new ways to try to combat the bloodsuckers before they become more of a problem than they already are. Their discovery of “mutant bed bugs” appears to be the same troubles that we are experiencing here in the United States. You may read the article here. Trying to kill NY or NJ bed bugs on your own will prove to be an uphill battle as they are masters at hiding in odd places. Their tiny size and their ability to multiply quickly make them one of the most frustrating and most difficult household pests to eliminate. 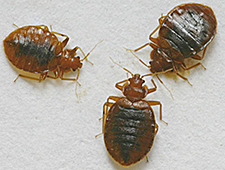 Store bought chemicals have proven to be ineffective on bed bug infestations. Your best bet for treating NY or NJ bed bug infestations is to contact a licensed pest control expert with extensive experience in bed bug eradication services. Continuing from Monday… Search the internet and you will many different articles suggesting different ways to deal with bed bug infested laundry. As many consumers have learned, not all information they read online is accurate. Two scientists, R. A. Naylor and C. J. Boase, from the University of Sheffield in England performed tests to find out exactly what kills bed bugs in laundry. Their interesting research is sure to help those who are suffering through a bed bug infestation. Treating bed bugs on clothing and other fabric items should be handled carefully. Consumers should take special care when moving things around and taking items out of infested rooms. Items should be packed up or placed in a bin so that bed bugs cannot drop off and spread to other locations in the home. Some pest control experts report that running bed bug infested items through the dryer only is sufficient in killing all stages of bed bugs. It should be noted that some consumers have reported that they have found that some bed bugs have been able to survive this would-be cycle of death by slipping into, and lurking in the dryer vent area. NYC pest control experts recommend washing AND drying all bed bug infested clothing on hot heat in order to obtain absolute kill of bed bugs. According to the “Insects in the City” article authored by Dr. Mike Merchant at Texas A & M AgriLIFE Extension, the research performed will help in the disinfection process of laundry. According to their findings, all stages of bed bugs are killed during the dry cleaning process. Some consumers are finding that some dry cleaners will not provide treatment for bed bug infested clothing. It is important to advise a dry cleaner of the infestation as they typically have special protocol that is followed so that they do not become infested.